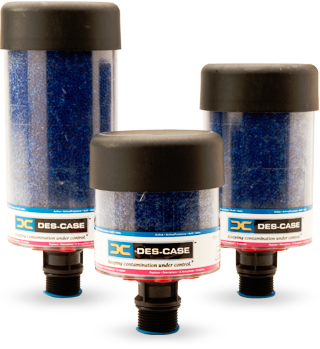 DES-CASE Breathers are the first line of defense against contamination. From the time oil enters your factory to the end of its life, protecting it with DES-CASE’s range of innovative breathers will extend the life of your machinery and decrease your downtime, leading to a huge cost saving. DES-CASE’s contamination control products are used in a wide range of applications including gearboxes, hydraulic and lube oil reservoirs and storage/process tanks. 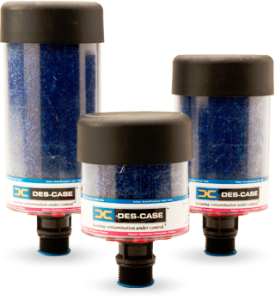 DES-CASE Standard Disposable Desiccant Breathers attack the source of contamination to extend lubricant life and to increase equipment productivity. As wet contaminated air is drawn through the unit, multiple 3-micron polyester filter elements remove solid particulate and the colour-indicating silica gel extracts moisture. When air is expelled from the container, the top foam pad prevents oil mist from contacting silica gel or entering the atmosphere. Visit Neilson Hydraulics E-SHOP to view the DES-CASE range. We supply DES-CASE Standard Disposable Breathers, DES-CASE Hydroguard™ Hybrid Breathers, DES-CASE VentGuard™ Hybrid Breathers, DES-CASE Extreme Duty Breathers, DES-CASE Non-Desiccant Breathers, DES-CASE Breather Adaptor & Accessories. This entry was posted on January 7, 2016 at 12:05 pm. You can follow any responses to this entry through the RSS 2.0 feed. You can leave a response, or trackback from your own site.